In the post-material era, people are increasingly focusing on the pursuit of happiness. This popular interest has been met by a growing number of authors and interventionists who promise routes to happiness. In large part, these avenues to the good life are anchored in the results of scientific studies. Here, we offer the caution that there may be an optimal level of happiness. While it is true that happiness is widely beneficial, there is also a growing body of research suggesting that it is not always beneficial for all people. In this chapter, we define happiness and review the literature suggesting that more nuance discussion is needed. We focus on three ways that happiness might be sub-optimal, including mood dysregulation (being happy regardless of circumstance), complacency (curtailing effort), and affect imbalance. We conclude by discussing three contexts that interventionists and policy makers ought to consider when promoting happiness. These include attention to happiness in specific life domains, distinguishing between short and long-term happiness, and a deeper appreciation of how cultural factors affect the pursuit and experience of happiness. Everyone makes attributions. We believe our neighbor is a jerk, our spouse is generous, and that our pet dogs are loyal. Nowhere are these attributions more prevalent, perhaps, than in the context of happiness. Someone on holiday in Jamaica? Happy. Someone recently divorced? Unhappy. Someone whose team just won the championship? Happy. Someone who was in a minor collision on the way home from work? Unhappy. Interestingly, there is an unspoken assumption that happiness is the preferred emotional mode. Most of us would prefer to see more Jamaican vacations and sports wins and fewer divorces and fender benders. Simply put, we all want to be happy (Lomas, 2016). In fact, people—especially those living in Western or industrialized cultures-- treat happiness largely as they treat money: with an appetitive attitude. Indeed, Hobbes described happiness as the fulfillment of our human appetites (Kitanov, 2011). Just as people tend to desire more money, so too do they tend to desire more happiness. But, should they? The question of optimal levels of happiness is important in the modern context. We live in a post-materialist era in which large numbers of people are able to focus on happiness as important areas for personal development. This trend can be seen in the rise in popularity of the positive psychology movement (Seligman & Csikszentmihalyi, 2000) both among researchers and consumers. The sales of happiness related self-help books are further evidence that many people view happiness as highly desirable (Bergsma, 2008). This behavioral trend is echoed in survey results showing that people from widely differing cultures all believe that happiness is an important life outcome (Diener & Oishi, 2000). Further, there is increasing evidence that happiness is directly malleable – either through designed interventions (Tay & Kuykendall, 2013) or through deep brain stimulation (Synofzik, Schlaepfer, & Fins, 2012). We are entering an age where happiness is both highly valued and can be easy induced. Therefore, it is important to take a step back and question: Is there a downside to happiness? In this chapter, we begin by stepping back – Defining first what is meant by happiness. There are a variety of definitions of happiness and it is important that we define the boundary conditions of our discussion. Next, we elaborate upon what is meant by ‘optimal levels.’ Specifically, optimal levels of happiness may or may not result in detrimental outcomes and we discuss the forms in which these relationships can take. We build upon this foundation by examining what is currently know about optimal levels of happiness and present considerations for those looking to take the next steps in this endeavor. It is our hope that this chapter may be informative to those looking to understand the potential downsides of happiness and provide important considerations to those looking to extend the existing literature. The question of whether there can be “too much happiness” hinges, in large part, on definitions of this elusive concept. There are a variety of research traditions that address happiness. Perhaps the most widely known is that of subjective well-being (SWB; Diener, 1984). SWB is comprised of three separate but related elements. These are positive affect, negative affect, and life satisfaction. At the heart of SWB is the notion that happiness is a subjectively experienced phenomenon, and that it includes both affective and cognitive appraisals of life. A happy person, according to the SWB framework, would be someone who feels generally satisfied with her life, experiences a preponderance of positive emotion and only occasional and appropriate negative emotion. By contrast, there are a number of lines of research that focus more broadly on well-being, and which include what are, arguably, more objective phenomena. Perhaps the best-known example is psychological well-being (PWB; Ryff & Singer, 1998). Psychological well-being includes mastery, autonomy, relatedness, growth, self-acceptance, and meaning. A happy person, according to this framework, would be someone who has a sense of competency, balances autonomy with high quality relationships, experiences opportunities for personal growth, accepts herself, and enjoys a sense of being engaged in meaningful goals. Recently, it has become en vogue in the field to classify these two types of approaches to studying happiness as if they represent 2 distinct happiness concepts. These include “hedonic” happiness, which emphasizes the affective dimension, and “eudaimonic” happiness, which emphasizes the objective functioning of the individual (Ryan & Deci, 2001). For an in-depth discussion of this topic see Keyes and colleagues (2002) and Kashdan and colleagues (2008). For our purposes in this chapter, we will largely confine our discussion of optimal levels of happiness to the subjective, emotional aspects of the topic. In part, we do this because a comprehensive coverage of every model of well-being is beyond the scope of any single work. That said, we will give brief coverage to both, including attention to life satisfaction (a cognitive dimension of happiness). Regardless of the specific definition, it is important to note that research from all traditions support the idea that happiness does not just feel good; it is good. That is, happiness confers tangible benefits in a wide range of domains. Reviews examining the hedonic tradition show that, across different study types (cross-sectional, experimental, longitudinal) and across different domains (health, work, and relationships), those experiencing more positive emotions tend to live longer and healthier lives (De Neve, Diener, Tay, & Xuereb, 2013; Lyubomirsky, King, & Diener, 2005; Pressman & Cohen, 2005). Similarly, Ryan and Deci (2001) argue that eudaimonic experiences of happiness are, by definition, beneficial. When people experience growth, self-acceptance, or connectedness with others, for example, they are experiencing high functioning. As evidence, Ryan and Deci (2001) review research linking physical health to eudaimonic states. In both eudaimonic and hedonic frameworks these benefits appear to be consequences of happiness as well as causes. Thus, happiness can be seen as a means as well as an end. The aforementioned literature on the benefits of happiness are from studies that assume the relationship between happiness and other outcomes are exclusively linear. It is only recently that researchers have explored the potential downsides of happiness and employ the analytic techniques that could detect such a relationship. Non-linear relationships can take on many forms; however, we are concerned with only two in our discussion of optimal levels of happiness. First is what is commonly referred to as the inverted-U shaped curve. 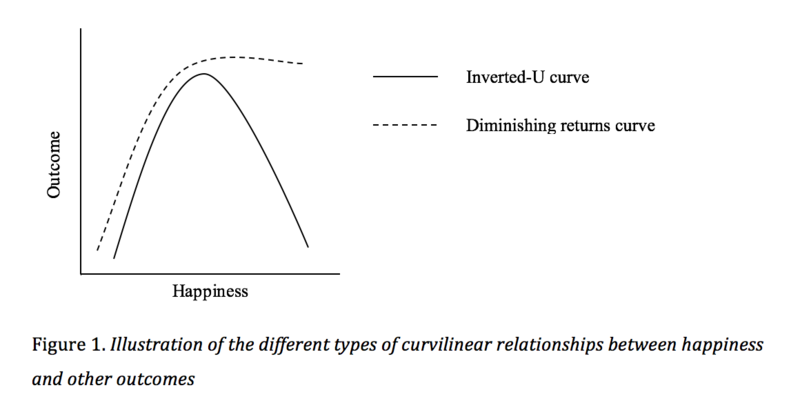 This curve (Figure 1) represents the ‘too much of a good thing’ hypothesis, where happiness is beneficial for an outcome only until a certain point, after which happiness actually becomes detrimental. Figure 1 also shows a less severe version of the curve in which there are diminishing returns. With the diminishing returns curve, happiness reaches an optimal level, but higher level of happiness do not necessarily detract significantly from the outcome of interest. Both theoretical curves indicate optimal levels of happiness, however, they differ in terms of what happens after happiness reaches an optimal level. How Can Happiness Be Bad? For as popular a topic as happiness is, there appears to be a conspicuous absence of cautionary restraint regarding the topic (Kashdan & Biswas-Diener, 2015). Although happiness feels good, and is associated with a variety of benefits, we know little about how much happiness is optimal, and for whom, and when. As noted earlier, the research evidence seems to indicate that happiness is always beneficial, and this is also true of popular press books. An example of this can be seen in Achor (2010), “We can all reap the benefits of the happiness advantage if we work hard enough at it. Remember, happiness is not just a mood—it’s a work ethic” (p. 50). This view of happiness leads one to question: How can happiness be bad? To answer that, we discuss three different possibilities that bring the unilateral goodness of happiness into question. Affect-as-Information Theory. Among the most highly cited theories in emotion research is “mood as information” (Carver, 2003; Schwarz & Clore, 1983). This theory emphasizes the idea that mood states offer useful information to those experiencing them on how to respond to their environment. Anger, for example, is a signal that an individual’s person, group, property, ideals, or love ones are under immediate threat (Kashdan & Biswas-Diener, 2015). Similarly, happiness can be a signal that no such threats are present and that it is safe for a person to be more sociable, exploratory, or relaxed (Ito & Cacioppo, 1999; Fredrickson, 2001). When modern self-help gurus advocate more happiness, they often miss the informational value of emotion. They operate from the premise that negative moods feel bad, should be avoided, and can be side-stepped through mental and behavioral intervention. By the same token, positive moods can be amplified and extended through similar intervention. In both cases—positive and negative moods—the idea of artificially promoting one state, regardless of context, may be encouraging a process that divorces people from an important channel of information about the world. Hence, individuals who are ‘too happy’ may be overlooking important information, dampening their ability to function personally and socially. Valuing Happiness. Another way happiness can be bad is if individuals place too much value on it. Mauss and colleagues (2012) present the case that individuals who value happiness too much may set unrealistic happiness goals. Ultimately, when they fail to achieve these unreachable goals, they experience feelings of disappointment and sadness. In a series of two studies, Mauss and colleagues (2011) found evidence for this effect such that those who valued happiness actually experienced less positive emotions and more negative emotions. Valuing happiness too much may also come at a price to one’s social relationships. Mauss and colleagues (2012) demonstrated that when individual value happiness (defined as personal gains) too much, they a bound to destroy social connections leading to feelings of loneliness. They found evidence of this through both self-report and salivary measures. Taken together, these studies offer potential nuance to the “happiness is beneficial” narrative. Affective Forecasting. The last way through which happiness could have adverse consequences is through errors in affective forecasting. When projecting future emotional states, individuals tend to underweight the potential impacts of negative events, believing instead that tomorrow will hold a bright future (Schacter & Addis, 2007; Sharot, 2012). This optimism is, in part, functional – as it helps individuals persevere through difficult times in hopes for a better tomorrow. However, much like valuing happiness too much, these expectations could act as a double-edged sword (O’Brien, 2013). Individuals tend to hold onto an optimistic attitude even when there are several signs to the contrary. Hence, when that better future does not come, they are often left discouraged and frustrated. With these three possibilities in mind, we now move to reviewing the existing evidence for optimal levels of happiness. Although research on this topic is relatively new, we believe that there are three clear trends attempting to tackle this issue: Mood dysregulation, nonlinear happiness, and balanced happiness. Mood Dysregulation. There is a substantive rationale for inquiring about a potential optimal level of happiness. The most obvious point of reflection on this topic is to be found in instances of mood dysregulation. People suffering from bi-polar disorders, for instance, often experience intense positive affect in a disruptive way (Gruber, Mauss & Tamir, 2011). People experiencing mania may be likely to take risks or act in inappropriate ways that are damaging to themselves or those they care about. In a review of clinical research literature Gruber and colleagues (2011) conclude, “I argue that troubled emotional functioning in bipolar disorder might be explained by an unrelenting experience of heightened positive emotions regardless of the external context…. In fact, feeling ‘too good’ may actually be detrimental” (p. 362). However, evidence of mood dysregulation is not limited to those with clinically diagnosed psychological disorders. Another line of research on affect regulation comes from Diener and colleagues (1991). They examined the effects of various cognitive strategies on affect regulation across five studies. They discovered that the mental strategies people use to amplify happiness might have a psychological price. For example, cognitively amplifying positive affect can also have a spillover effect such that it amplifies negative affect as well. This dovetails with research showing that people with clinical depression who attempted to dampen negative emotions also showed diminished capacity to react expressively to amusement (Chentsova-Dutton, Chu, Tsai, Rottenberg, Gross & Gotlin, 2007; Chentsova-Dutton, Tsai & Gotlib, 2010). Although the research on this topic is relatively small, it appears that effortful regulation strategies such as dampening and amplification are “blunt instruments” in that people may not be able to regulate either positive or negative affect without also regulating the other. Unbridled Happiness. Researchers have also begun to investigate the potential nonlinear relationship between happiness and several interesting outcomes. To the best of our knowledge, Oishi and colleagues (2007) were the first to directly raise the issue of linear versus non-linear benefits of happiness. They provide analyses of social survey and quasi-experimental data on the association of happiness with a variety of outcomes. The lion’s share of their scholarly attention is found in two areas: income and academic performance. With regards to the former, they reviewed a wide range of evidence showing that moderate, but not consummate, happiness is associated with higher income. For example, using data from a long-term longitudinal study of Australians they found that people who were a 4 out of 5 on a measure of life satisfaction enjoyed higher outcomes than did those who were a 5 out of 5. This same finding was replicated in a longitudinal study of students attending the University of Illinois. In this case, students who were a 4 out of 5 on cheerfulness made more money two decades later than did their happier counterparts. This trend—that happy people make more money than do very happy people—emerged again and again in nationally representative samples in Germany and in the United Kingdom. In addition to income, amount of positive affect also appears to be associated with academic performance. Specifically, Oishi and colleagues (2007) evaluated a variety of academic, social and psychological variables among University of Illinois students. To do this, they computed an affect balance score by dividing positive emotional experiences such as joy, affection, and contentment by negative emotional experiences such as anger, sadness and guilt. They found that those who were in the top quintile for affect balance (“very happy”) reported the highest levels of gregariousness, close friendships, self-confidence, energy, and spent the most time on romantic dates. By contrast, those who were in the 4th quintile (“happy”) had the highest grade point averages, the best class attendance, had the best balance of positive to negative life events, and were the most conscientious. Although Oishi et al (2007) represents a large-scale attempt to demonstrating the nonlinear relationship of happiness, several smaller scale studies have also attempt to answer this question. Recently, there has been increased interest on this topic in the organizational sciences. Baron, Tang, & Hmieleski (2011) showed that entrepreneur’s positive emotions could eventually lead to a downturn in firm performance. Interestingly, the severity of the downturn was more significant for smaller firms than larger firms. Relatedly, Lam Spreitzer, and Fritz (2014) found an inverted-U shape curve between positive emotions and prosocial behaviors at work. These researchers subscribe to the idea that too much happiness leads to complacency. If the perception is that things are going well, there is no need to be more financially successful or engage in prosocial behaviors. Hence, some have argued that the key to avoiding this downturn is a balance of the positive and the negative. Affective Balance. Could the key to optimal levels of happiness be a mix between positive and negative feelings? Many researchers have tangentially touched on this issue by examining the effects of ratios of positive to negative experience (e.g., Meeks, Van Haitsma, Kostiwa, & Murrell, 2012; Fredrickson & Losada, 2005; Gottman & Levenson, 1992). Rather than charting boundary conditions, however, these researchers were primarily interested in the finding that ratios need to favor positivity in order for people to function well. However, there have been some notable exceptions. A study conducted by Friedman and her colleagues (2002) assessed outcomes, such as self-deception, aggressiveness, and hypomanic symptoms, of 72 people who had above average emotional balance ratios and determined there was little support for “too much happiness.” Even so, this is only a single study, and not without its limitations. It could be that the average affect balance score was not sufficiently high to reach a threshold for “too happy.” Alternatively, it might be that the outcome variables of interest were not those most likely to capture the “too much happiness effect.” Specifically, the researchers were looking for instances in which happiness is actually negative for the person experiencing it. It may be that high levels of happiness remain beneficial, but less beneficial than are moderate levels of happiness. Hence, it is not too surprising to find other studies using affective balance have found significant effects. Specifically, Regu, Sousa, Marques, and Pina e Cunha (2012) were concerned with testing whether a balanced positivity ratio is necessary for creativity such that if one is too positive, they may not be creative. Indeed, they did find that this was the case – those with an excessively positive ratio were less creative than those with more balanced ratios. Although Barker, Howard, Galabos, and Wrosch (2016) did not use a positivity ratio, they found the happiest students who experienced some negative emotions had the highest GPAs. In fact, during semesters when negative emotions were below average, the happiest students had lower GPAs than those with lower positive emotions. Thus far, we have laid down the conceptual underpinning of why happiness could be a detrimental and reviewed the existing evidence on the topic. In this next section, we take a look to the future and provide several considerations for those interesting in optimal levels of happiness. Specifically, we discuss how optimal levels may depend on life domain, short- vs. long-term happiness, intensity vs. frequency, and culture. Life Domain. Oishi and colleagues (2007) conducted many analyses whose results suggest that there may be an optimal level to happiness. Interestingly, the majority of their results point to achievement oriented domains as being likely contexts in which the advantages of additional happiness are non-linear. In their examination of university students, for example, the happiest students seem to have the highest scores for social relationships, confidence and energy, while the next happiest group showed superior academic achievement. This is in line with prior research suggesting that the variable that best distinguishes the happiest and least happy people is the presence of high quality social relationships (Diener & Seligman, 2002). In fact, Oishi and colleagues (2007) analyzed data from the World Values Survey and found an optimal happiness effect (non-linear) for achievement domains but not for social domains. A variation of their findings is presented in Table 1. As can be seen, happiness appears to be generally beneficial but the very happiest people do not perform quite as highly as do happy people. This effect holds for both men and women. These points raise the issue of one possible way that too much happiness might interfere with functioning in achievement oriented domains. Namely, through cognition. Researchers have noted stark differences in the thinking styles of happy and unhappy people (Lyubomirsky & Ross, 1997). Baumeister and colleagues (2007) noted that emotions can deleteriously influence behavior by interfering with optimal cognitive processing. For example, researchers have found that happy people are more likely to perceive less risk (Haase & Silbereisen, 2011) and more likely to be susceptible to false memories (Storbeck & Clore, 2005). Further, research reveals that people in a good mood perform worse than others on tests of moral reasoning (Zarinpoush, Cooper & Moylam, 2000) and make worse estimates of correlation (Sinclair & Marks, 1995). It is possible that the potentially negative impacts of positive affect on cognition are less relevant to the social arena. Indeed, Oishi and colleagues (2007) did not report an optimal level of happiness for social domains. Although the strong link between high quality relationships and happiness is often reported in research, little is known about how the quantity of relationships relates to happiness. It may be that very high levels of happiness have a direct and causal influence on relationship maintenance. Happy people appear to be more sociable and connected with others (Lyubomirsky, King, & Diener, 2005). This does not mean, however, that more time socializing is associated with greater happiness dividends in a linear fashion. In fact, Diener and colleagues (2008) found evidence for diminishing marginal utility of time spent socializing. Short- vs. long-term happiness. Another consideration in the context of optimal levels of happiness is the trade-offs between short-term and long-term happiness. The recent focus on hedonic (emotional) and eudaimonic (non-emotional) aspects of well-being may have distracted from attention to timeframe. Historically, researchers have examined momentary happiness (Scollon, Diener, Oishi, & Biswas-Diener, 2004), frequency of happiness (Schimmack & Diener, 1997), and a continuum of happiness that includes the past, present and future (Pavot, Diener, & Suh, 1998). For instance, Wirtz and colleagues (2003) examined anticipated, experienced, and recalled happiness among college students during and around the period of their spring break. It may be that the answer to the question of whether there can be too much happiness depends upon whether one is referring to short term or long term happiness, or to the trade-offs inherent between them. For instance, a person experiencing high satisfaction with her grades may choose to study less than someone with only moderately high satisfaction. In essence, she would be counterbalancing short term happiness (current level of satisfaction) with estimated future levels of happiness. The way that people allocate resources and make decisions in the short and long term is likely of crucial importance to the idea of optimal happiness in achievement oriented domains. Initial research is suggestive that people differentially preference pleasure in the short term, and meaning in the long term (Kim, Kang & Choi, 2014). Intensity vs. Frequency. One important consideration in the question of optimal happiness is related to the question of “what is happiness?”. Indeed, if happiness is defined as meaning in life then the idea of too much meaning may be less sensible than if happiness is defined as emotion. As happiness research was becoming established in the 1980s and 1990s researchers were interested in which aspects of emotionality appeared to capture this elusive concept best. Research revealed, for instance, that people who experience intense negative emotions are also more likely to experience intense positive ones (Diener et al., 1985; Larsen, Diener & Emmons, 1986). However, positive and negative affect does not often co-occur at high rates of intensity (Diener & Iran-Nejad, 1986). Diener and colleagues (1991) concluded that frequency (but not intensity) of positive affect is both necessary and sufficient to produce high scores on a wide range of happiness measures. Pressman and Cohen (2005) suggested those experiencing high arousal positive affect might experience decrements in their physical health. This leaves open the question of whether—when considering optimal levels of happiness—it might be possible that happiness is “too intense” and/or that happiness might be “too frequent.” Both considerations need further investigation. Culture. Another consideration involves the question of who, specifically, is experiencing the happiness. Cultural factors may moderate the relationship between happiness and its benefits. Psychologists often research culture as divided into two broad categories: individualist and collectivist cultures (Triandis, 1998) and these roughly map onto so-called Eastern and Western societies. There is also a robust research literature on the ways that culture affects the experience of emotion (see, for example, Tsai, 2007; Suh, 2000). Researchers gave especially identified the ways that cultural leanings in cognition can affect emotional processes. For example, Lam and colleagues (2005) examined differences between individualists and collectivists with regards to affective forecasting (predicting future emotional states. They found that people from Eastern cultures (collectivists) were less likely to cognitively focus and were, therefore, less likely to experience the types of affective forecasting biases common in individualists. Other studies have shown striking cultural differences in the experience of emotion itself. For instance, Chentsova-Dutton and her colleagues (2010) investigated the emotional reactivity of Eastern and Western people diagnosed with clinical depression. They found that Westerners with depression showed dampened responses to amusing films whereas their depressed Eastern counterparts did not. This suggests that Westerners have a different predisposition to distress tolerance and attempt to suppress their negative emotions. In doing so, they also suppress positive emotions. A similar pattern was not seen among the participants from Eastern cultures. Relatedly, the consequence of expression emotions may depend on the culture. Kitayama et al. (2015) found that expression of anger led to higher health risk in American samples, but lower health risk in Japanese samples. Given these stark cultural differences in emotion, it makes sense to wonder whether a possible optimal level of happiness would be similar across cultural groups. In a related study, Ford and colleagues (2015) investigated whether motivation to pursue happiness produced different results for people from various cultures. They found that for people from the United States, high motivated to pursue happiness experience lower well-being but this was not the case with people from East Asia. The authors posit that the how of happiness pursuit may be implicated. Specifically, East Asian may be more likely to pursue happiness through social connectivity. This is important in the context of social relationships discussed above. It may be that Americans rely more heavily on cognitive strategies (those most likely to be affected by high levels of positive emotion) and that they are more likely to treat happiness as an achievement (a stance with, possibly, a greater link to optimal levels of happiness). Although there is no definitive study or line of research linking cultural factors to optimal happiness it is a worthwhile area of focus for future study. In the end, charting the boundary conditions at which happiness is beneficial is an important undertaking. A small but growing body of research suggests that there may, indeed, be an optimal level of happiness. Our preliminary understanding of this threshold suggests that this might especially be true for achievement oriented life domains but not necessarily for social ones. In addition, it may be that the answer to the question of optimal happiness depends, in part, on type of happiness as well as on cultural factors. Differences in cultural background may be not be the only between-group factor influencing what is considered optimal. For example, Diener, Nickerson, Lucas, and Sandvik (2002) show that cheerfulness predicts job outcomes differently depending on financial background. Further, these differences were found with regards to a discrete emotion (cheerfulness) as opposed to evaluating general happiness, which is the focus of most of the existing research. Additional research is needed to sufficiently explore these areas and graduate students, especially, are encouraged to look to this as a largely unexplored area for investigation. Regardless of specific thresholds, domains, or intrapersonal factors involved, it should be noted here that we are not suggesting overtly deleterious consequences of happiness. Indeed, a robust literature points to the conclusion that happiness is widely beneficial. We are merely arguing that there may not be a linear relationship between happiness and its many dividends. Rather, in some cases the very happiest people may fare slightly less well than do their moderately happy counterparts. This area of happiness research is especially important in an era of increasing attention to happiness intervention and policy. As clinicians, coaches, and policymakers offer training programs and allocate resources to enhance well-being the cautionary note of optimal levels is worth consideration. This is especially true in the context of mood as information. Lay people ought to be encouraged to promote happiness when it is contextually appropriate. Too strong an emphasis on the pursuit of happiness or the experience of happiness when other emotions are more appropriate may, in fact, be deleterious. Further research on the question of optimal happiness will ultimately lead to more sophisticated, more individualized, and more effective interventions and policies. Achor, S. (2010). The happiness advantage. New York: Crown Business. Baumeister, R. F., Vohs, K. D., DeWall, N. C. & Zhang, L. (2007). How emotion shapes behavior: Feedback, anticipation, and reflection, rather than direct causation. Personality and Social Psychology Review, 11, 167-203. Biswas-Diener, R. Diener, E. & Lyubchik, N. (2015). Wellbeing in Bhutan. International Journal of Wellbeing, 5(2), 1-13. Chentsova-Dutton, Y. E., Chu, J. P., Tsai, J. L., Rottenberg, J., Gross, J. J., & Gotlib, I. H. (2007). Depression and emotional reactivity: Variation among Asian Americans of East Asian descent and European Americans. Journal of Abnormal Psychology, 116(4), 776- 785. Chentsova-Dutton, Y. E., Tsai, J. L., & Gotlib, I. H. (2010). Further evidence for the cultural norm hypothesis: Positive emotion in depressed and control European American and Asian American women. Cultural Diversity and Ethnic Minority Psychology, 16(2), 284-295. De Neve, J. E., Diener, E., Tay, L., & Xuereb, C. (2013). The objective benefits of subjective well-being. World happiness report. Diener, E. & Biswas-Diener, R. (2008). Happiness: Unlocking the mysteries of psychological wealth. Malden, MA: Blackwell. Diener, E. & Oishi, S. (2000). Money and happiness: Income and subjective well-being across nations. In E. Diener, & E. M. Suh (Eds. ), Culture and subjective well-being (pp. 185-218). Cambridge, MA: MIT Press. Friedman, E. T., Schwartz, R. & Haaga, D. (2002). Are the very happy too happy? Journal of Happiness Studies, 3, 355-372. Gottman, J.M., & Levenson, R.W. (1992). Marital processes predictive of later dissolution: Behavior, physiology, and health. Journal of Personality and Social Psychology, 63, 221-233. Ito, T. A. & Cacioppo, J. T. (1999). The psychophysiology of utility appraisals. In D. Kahneman, E. Diener, & N. Schwartz (Eds. ), Well-being: The foundations of hedonic psychology (pp. 470-488). New York: Russell Sage Foundation. Kashdan, T. & Biswas-Diener, R. (2015). The upside of your dark side. New York: Hudson Street Press. Keyes, C. L. M., Shmotkin, D., & Ryff, C. D. (2002). Optimizing well-being: The empirical encounter of two traditions. Journal of Personality and Social Psychology, 82, 1007-22. Lam, K., Buehler, R., McFarland, C., Ross, M. & Cheung, I. (2005). Cultural differences in affective forecasting: The role of focalism. Personality and Social Psychology Bulletin, 31, 1296-1309. Lomas, T. (2016). The power of negative emotions. London: Piatkus Books. Schimmack, U., & Diener, E. (1997). Affect intensity: Separating intensity and frequency in repeatedly measured affect. Journal of Personality and Social Psychology, 73(6), 1313-1329. Sharot, T. (2012). The Optimism Bias: Why we're wired to look on the bright side. New York, NY: Pantheon. Sinclair, R. C. & Mark, M. M. (1995). The effects of mood state on judgmental accuracy: Processing strategy as a mechanism. Cognition & Emotion, 9, 417-438. Triandis, H. C. (1998). Individualism & collectivism. Boulder, CO: Westview Press. Tsai, J. L. (2007). Ideal affect: Cultural causes and behavioral consequences. Perspectives on Psychological Science, 2, 242–259.